Eren Jaeger vowed to rid mankind of the bloodthirsty giants who devoured his mother and destroyed his city. Now, after discovering that he has the ability to turn into a Titan, the world Eren promised to protect looks at him like he is the monster. Narrowly avoiding execution, Eren’s fate is entrusted to the Scout Regiment where he must prove capable of following orders. But on an expedition outside the wall, a unique female Titan appears and cuts through the Scouts, leaving a trail of carnage and splintered bones behind her and making it difficult for Eren to control his rage. As it becomes obvious that a traitor is sabotaging the Regiment from within, Eren must ask himself who humanity’s true enemy really is. Special Features: Episode Commentaries (14, 25), Attack on Titan at Anime Expo (Blu-ray only), “Chibi Theatre: Fly, Cadets, Fly!,” Days 14-25 (Blu-ray only), Eyecatch Gallery, Textless Songs. 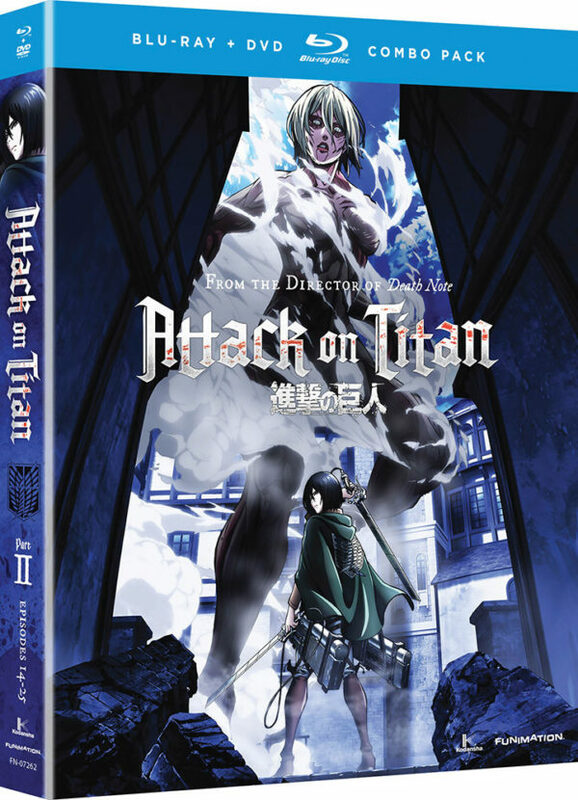 Be the first to review “Attack On Titan Part 2” Click here to cancel reply.